Sunday was an awesome touristing day. 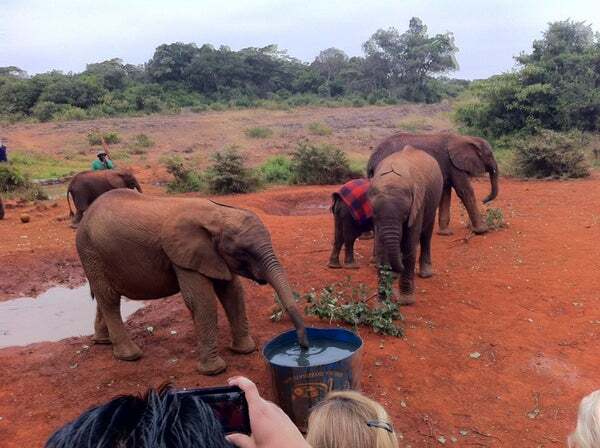 We went to the Sheldrick Trust, also known as the baby elephant orphanage. It's as adorable as it sounds, with young elephants playing with each other and with the crowd, and being given a chance at a normal life after their mothers fell victim to poachers. From there, we had plans to go to Karen Blixen's house (see Meryl Streep in the film Out of Africa), but were convinced by our friend Stephanie to go to Lake Naivasha for a boat ride and a hike. If you've never been to Kenya, you should come just for Lake Naivasha. It's got some of the best bird watching in the world, and hippos galore. We took a boat ride out to an island in the lake where we walked among wildebeests, zebras, monkeys, and more. It was a great day. But then back to business. Monday morning we rose early to meet up with Mac, Kiva's Senior Field Support Specialist based in Nairobi; Patrick, the Kiva Fellow assigned to one of our Kenyan Field Partners, SMEP; and Mary from SMEP's main office in Nairobi. Together we headed out to SMEP's branch office in Rongai, on the outskirts of the city. Along the way we picked up Jackie, the local SMEP representative, and set off to meet the first five borrowers of our journey. First up was Tabitha, a long time SMEP client who runs a hair salon, poultry business, vegetable farm, and dairy operation all out of her home. 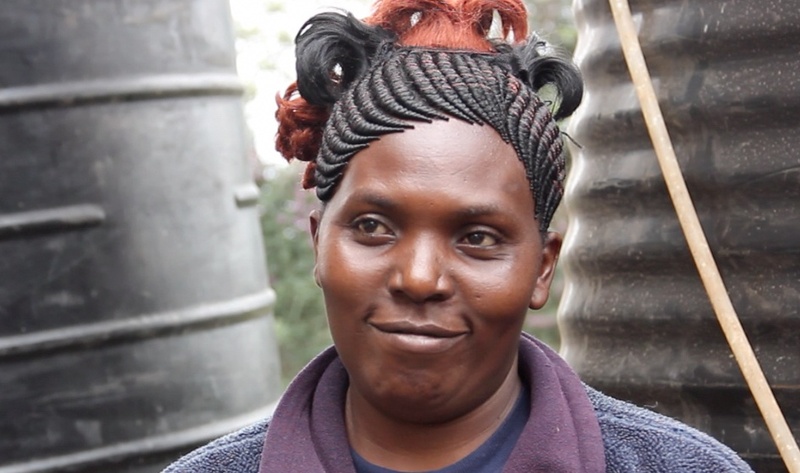 She used her Kiva loan to purchase a water tank and rainwater system that allows her to have enough clean, cheap water for her chickens and her family. This became a common theme. Throughout the day we kept seeing two things: 1) A lack of good, clean water, and 2) the wonderful things water-related loans were doing to bring costs of clean drinking water down for borrowers. While at Tabitha's home, we met her infant daughter, her three sisters, and her hilarious father. He was quite taken with Liz (he was far less interested in the men), but was a perfect gentleman, and even offered us tea. Unfortunately, we had another borrower waiting so we had move on. Back on the road, we headed to meet Hannah. On our way there, we had what we're told is a quintessentially Kenyan experience -- the rutted road. The dirt road to her home was deeply uneven, and we could drive no more than 5 mph on it. By the time we arrived, we had lost all sense of balance and equilibrium. Luckily it was restored when we met Hannah and her brother, both of whom couldn't have been more charming. The rutted road to Hannah's. Hannah is also a long-time SMEP client, having worked with the organization for almost ten years, and had recently taken out a water loan. She talked about having to buy water jugs at high prices before she bought her own water tank. She was immensely charming, and had an amazing hair style. One of the things we've noticed in Kenya is the women's hair fashions -- they're far more creative and varied than anything we've seen in the States. Hannah also invited us for tea, and here we had enough time to indulge. We sat in her beautiful home (by far the nicest we'd seen that day), and she served us milky tea with chocolate! We had never had tea with chocolate, but it was a revelation. This may need to become a regular thing at the Kiva office. While we were at her house, her husband called and wanted to talk to me (Buckley). I was a little nervous, but I shouldn't have been. He spoke to me about how grateful he was to have the support of SMEP and Kiva, and how much it had meant to his family. He wanted to thank us for our work and to encourage us to continue doing more. A running theme of these visits was gratitude. Many of the borrowers didn't know what Kiva was, only that their loans had been put on the internet for people to fund. But they were universally grateful for the help, and seemed to feel pride in the fact that they were able to take this opportunity to improve their lives. Gratitude and opportunity would be the main points of our next visit, with Lamech the Chemist (aka pharmacist). We visited his roadside pharmacy and found a clean space with all the medicine you'd expect in a Western pharmacy (cough medicine, aspirin, antibiotics, etc.) and some that you wouldn't (de-worming pills). Lamech spoke to us about how SMEP is helping raise people out of poverty, and how they foster long-term growth of the individual and the business. He's used his loan to stock his store, allowing him to build a base of loyal customers who trust that he'll have high quality supplies when they need them. He was happy to speak with us, and it was a pleasure meeting him. Across the street, we met Bob the Barber in his barbershop. Bob's loan allowed him to open a second location and hire additional staff. After the success of his second shop, he plans to take out additional loans to expand even further. He dreams of opening a large salon in Nairobi, and we have no doubt he'll be successful. We were in a hurry to meet Gladys, the final borrower of the day. Gladys lived back toward central Rongai, and had taken a loan for a water tank. Adjacent to her house, she was in the process of building a few small rooms to rent out, and the water would help in the construction and eventually serve the new residents. While we'd hoped to get a good interview with Gladys, she wasn't as comfortable speaking English as the others. Jackie helpfully translated for us, but the real problem were the goats! Gladys had four goats in her yard, and they didn't like us one bit. Once we started recording, they started talking with one another so loudly you can barely hear anything else. Alas, you can't please everyone. After a marathon day, we went to lunch with the SMEP crew and our drivers. It was good to unwind, and have some tasty Kenyan food. We said our goodbyes and then headed back into Nairobi to put our feet up and reflect on the day. The Kiva/SMEP team (from left to right) Liz, Mac, Jackie, Mary, Patrick, with Buckley behind the camera. The experience was a little different for each of us. Liz had visited borrowers before during her Kiva Fellowship in Armenia, so while the stories were unique and the experience wonderful, this wasn't so new to her. For me (Buckley), this was mind-blowing. I was touched by the genuine gratitude expressed by the borrowers. It feels a little cliche to say it, but for the first time I felt like the work I've done at Kiva had made a real, tangible difference in someone's life. While I know intellectually that the work Kiva does provides some level of assistance, to see it "in the flesh" was moving in a way that I didn't expect. Kenya is a country with lots of problems -- terrible infrastructure, corruption (we've had two attempted shakedowns by police officers already), lack of education, and lack of opportunity. But beyond all of that are people that in my estimation are some of the kindest and most hospitable on the planet. The borrowers we met today have grit, having grasped at opportunities to improve their lives, even in the absence of formal support structures we enjoy in the West. I don't think I'll forget this day for the rest of my life. This post is by Buckley White and Liz Nagle, two Kiva staff members traveling through Kenya for the first time. Their mission: To give our lenders an unfiltered view of life in the field and their Kiva loans at work. We hope you enjoy! Want more of Liz and Buckley? Follow the hashtag #KivaTrip on Twitter. Have questions about the #KivaTrip? You can send them our way at blog@kiva.org.